Description: 30T with 63 cars does a slow roll along the 1 Runner, passing a yard job working the south end. Once 30T gets permission down to Container, hell be off and running down the cutoff to Scranton and Enola. Description: Rare rebuild fills in for standard CP geep at Delaware Ave. Description: Yard 1 tugs a mix of Intermodal and general freight through the South end of East Binghamton yard. Description: Yard 1 slows to a stop at East binghamton Yard. 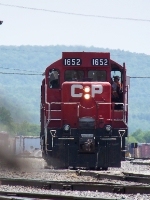 Description: A bad zoom in on CP GP9u #1652. Description: Two GP9u's shove cars into Conklin Yard as snow starts to fall. Description: CP DB-12 sorts a small cut of containers in East Binghamton Yard. Description: DB-32 heads for Temple-Inland with a GP9u on either end. CP 1545 is on the rear. Description: For some reason, teh colors came out better on this shot. If only I didn't have the drossing gate in this picture. Description: DB-21 does its part to rid the surrounding area of insects as it pulls out of the yard. Description: DB-21 with consecutively numbered GP9us works south on 1 Runner while 2-930 pulls in behind them, and a DB-42 crosses over to work down 2 Runner. Description: DB-21 heads south on 1 Runner with the 2 GP9s growling trying to keep the train moving. Description: With DB-21 working on a 38T cut, DB-42 pulls down 2 Runner for headroom with the inbound D&H 252. Description: DB-22 wais as the 164 attempts to get a unit started. Description: CP Yard Crew Working East Bingo at Terrace Dr. Description: Top of 1651 ad half of 1652. Description: Two GP9-Us take break until there next yard assignment. Note the old roudhouse buried in the hillside. Description: CP DB11 coming back from switching and passing DB12 on its way back into the yard. Description: CP local DB11 backs out of Conklin yard with D&H caboose 35712 to do some switching.